This Aquapruf 7400 Series Conveyor features three conveyors attached to one frame. The customer’s application requires two of these unique conveyor set-ups. These were engineered to either spread the product out or bring product closer together. Before getting to the first set of conveyors, the pizzas are spread out to maximize the topping process. These conveyors bring the pizzas together to accommodate the width of an existing spiral freezer. The second set then spreads the pizzas back out to feed into the wrapping equipment for packaging. 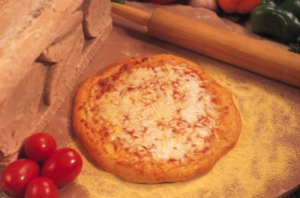 The conveyors are able to pivot out 2″ to increase the distance between pizzas. This is done manually by sliding the conveyor out by hand and locking in position using a clamp system. The project also required a 0.06” between custom conveyor frames to have the belts be at 1.02” from edge to edge. This is closer than what is possible with standard conveyors.